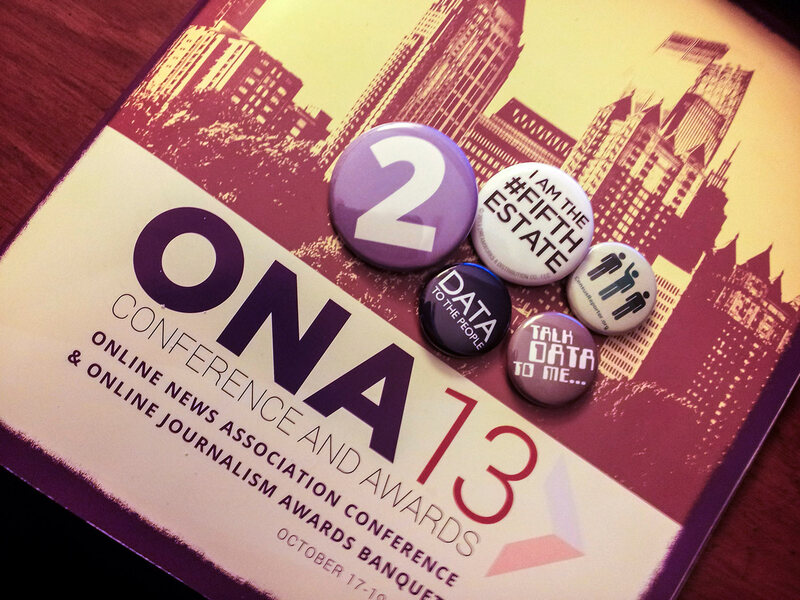 Earlier this month approximately 1,500 journalist/nerds gathered in Atlanta for the 2013 Online News Association conference. Here are some takeaways from the numerous sessions, busy midway and hundred of super smart people in attendance. What’s the best way to catch up with everything that happened? Check out the links below and review the Twitter feed for sessions that appeal to you. Attendees stretched the hotel wi-fi to the limits sharing their experiences and their tweets lend great insight into the heart of each session. One of the main challenges for different methods of displaying news is the limitations of the different CMSs that news organizations use. You have to think outside of the box to come up with solutions. Think Github basics, security utilities like Tor and SecureDrop and learning coding for journalists. User feedback — Listen to it! Why do people not share? Learn about new photo and video apps to improve your mobile storytelling. The main takeaway: Find a few key apps and learn them top to bottom. -The idea of second screen is pointless. Don’t worry about which screen people are using. Worry about providing the best experience on whatever screen the audience is using. A Fragile Trust: Public Faith in the Media – Where Have We Been, Where Are We Going? Don’t always think short – Some popular podcasts run 3 hours. The content drives engagement. People don’t listen on the desktop. Maybe 1 in 10 or worse. Meet your audience where they are–SoundCloud, Stitcher, etc. We need good analytics for what the audio audience is doing. Current analytics methods are lacking in this area. Some of WBUR’s most popular audio segments follow the “This is what ____ sounds like” template. This session focused on the idea and practice of using data and computers to do the heavy lifting when possible so reporters are freed up to dig deeper into stories and spend their time asking questions and following leads. There is a wealth of local, state and national data available to drive civic-minded stories. When trying to crowd-source information for civic projects, it must be something that people really want to contribute to or it will fall flat. We think about how to mobilize our newsroom and reporters to get on scene. But what is our plan for services we offer during and immediately after an event that helps the community? What does that look like? How does it work? Analytics in the Newsroom: What’s Next? Define goals then how to measure that. Context is key when it comes to analytics and data. Anytime a journalist is working on a story they need to be thinking about who the audience for that story is. What do they need? Not every story is or even should be an article. We write articles because it’s a traditional and yes–easy way to tell a story. We need to ask ourselves if an article is really the best way to tell the story. There are many other methods for sharing information–lists, short videos, GIFs, audio clips, games, tap essays and more. Just because something isn’t an “article” doesn’t mean it’s not real news or useful. Using data helps bring people close to their government. Fosters accountability and reveals corruption with less risk to journalists. Enables citizens to think critically about news and information. Having a presence on social media shows your audience that you are where they are. This allows you to be involved in the conversations in your community. There is always a moment when a story breaks and these days, that moment is happening on social media. We’re all dumb. But humor makes us smarter. A news app is 1 part story. 1 part engagement and 2 parts utility. *Add a dash of whimsy. Does your media outlet have an online ethics code? Start working on one. It takes time to answer questions like should all content be posted online forever? There are three common scenarios: I don’t know if the data exists – Call people, submit forms, search for datasets or bookmarked data. (It’s likely someone has already looked for the data) Data exists but what format do I want it in? – Learn your spreadsheets Data exists but it’s playing hard-to-get – There are a number of methods for wrangling data. Check out the slides for this session for more info. Anticipatory Computing – search is evolving to include sensors, data, context. Next year marks real beginning of anticipatory computing for the masses. Personalized Video – you must differentiate. Not every news org should be a tv station. Those that are need to be unique. Comments – commenting as it exists today isn’t adding value. It’s distracting the audience. Platform vs Publisher – News orgs can’t be both. Screenless Computing – nontraditional screens are growing in number. Be ready for how you will present on them. Drones – Drones come in different forms and help us see things we couldn’t otherwise. Hardware – New wearable and buildable technology means you can arm journalists and audience with sensors and printers. Statistics aren’t just numbers. They are facts that must be interpreted. Intuition is a poor judge of probability. If you play Russian roulette you have an 83% of surviving. But that doesn’t make it a good idea. Insiderism is the enemy of objectivity.